Lake Michigan has toughened us up. The criteria for whether we venture out or not have shifted to the right. The terms and conditions have changed from ‘we will venture out only when wave heights are two feet or less’ to ‘we will venture out as long as the furniture upstairs isn’t actively moving of its own volition across the boat’. I’ve reframed Carina’s pitchings and lurchings by imagining I’m on some marine fairground ride, which clearly I’m supposed to enjoy. Otherwise, it would probably have taken us a year to get down to Chicago. Ian was anxious to make some progress in that direction, so when the weather improved we made a very early start from Northport, to travel 60 miles down the coast to Frankfort. 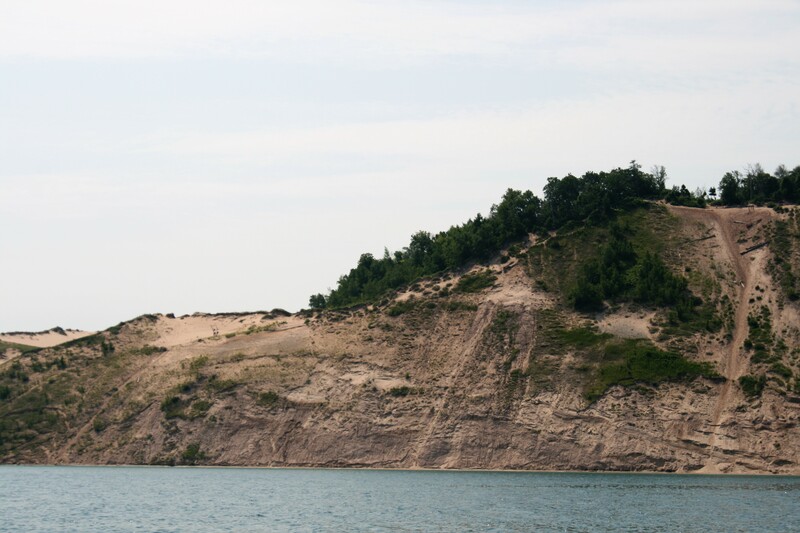 Michigan’s coastline has spectacular sand dunes, the largest fresh water dunes in the world, formed from glacial activity 16,000 years ago. In parts they are covered with trees and grass, and elsewhere the golden sand is exposed. 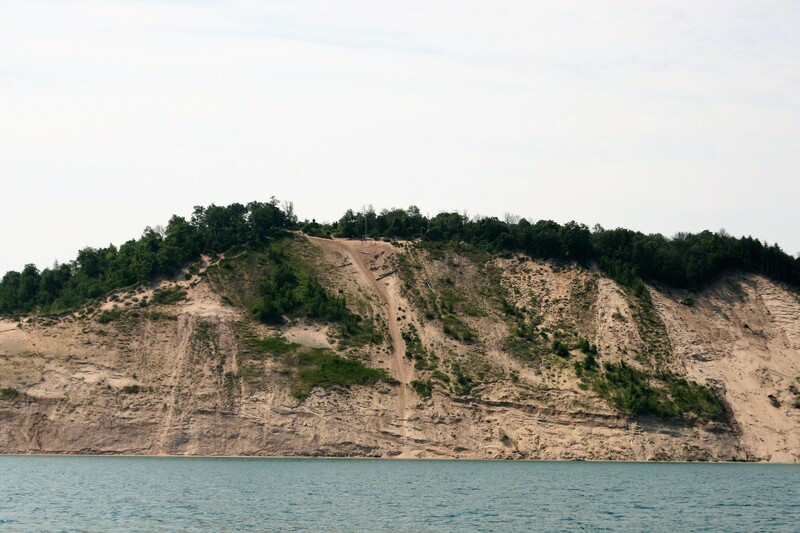 After we rounded the tip of the Leelanau Peninsula after leaving Northport, we got our first views of the Sleeping Bear Dunes, and later, North and South Manitou Islands, which are part of the Sleeping Bear State Park. 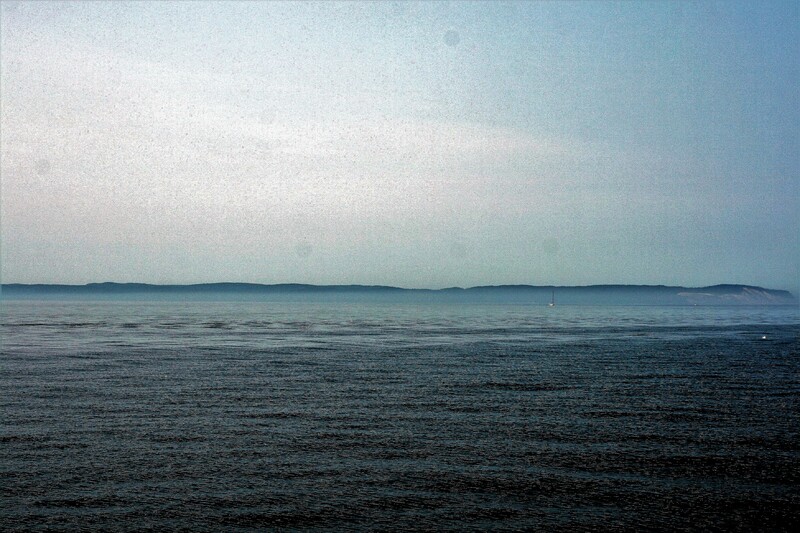 A low haze hung over the water, so we didn’t see the dunes quite at their best. I was sorry we didn’t have time to visit the Manitous. John had lent us a book about the history of North Manitou, by Rita Hadra Rusco, who had gone to live there in 1942. 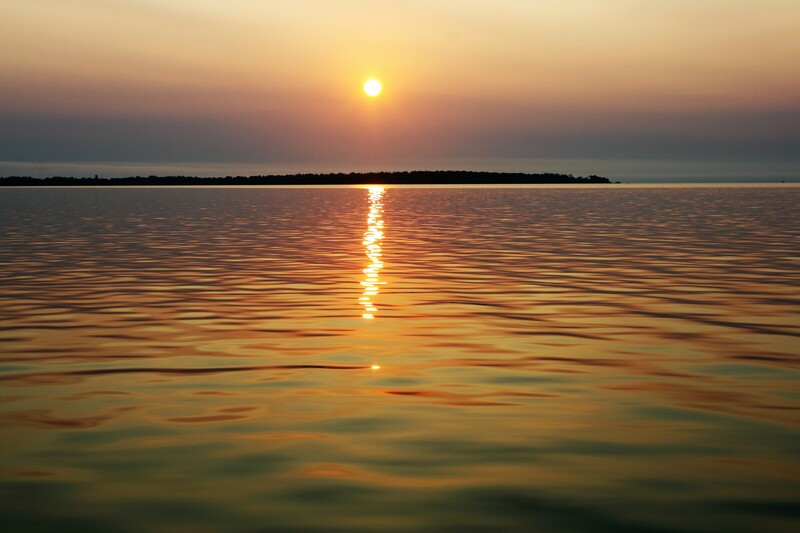 Her book, North Manitou: Between sunrise and sunset, tells the story of the pioneers who lived on the island during the 19th and 20th centuries, the harsh conditions they endured, and the small community that grew up there, only to eventually leave the island for ever in the late 70s, when the island was taken over by the National Parks Service. Houses and land were compulsorily purchased, and most of the buildings demolished. Rita’s plangent sentence “It is as reprehensible to ignore the island’s human history as it would be to desecrate a prime wilderness” seemed to summarise her sadness that a unique way of life had vanished, and her frustration that this had not been recognised by the Parks Service in its zeal to establish a wilderness area. 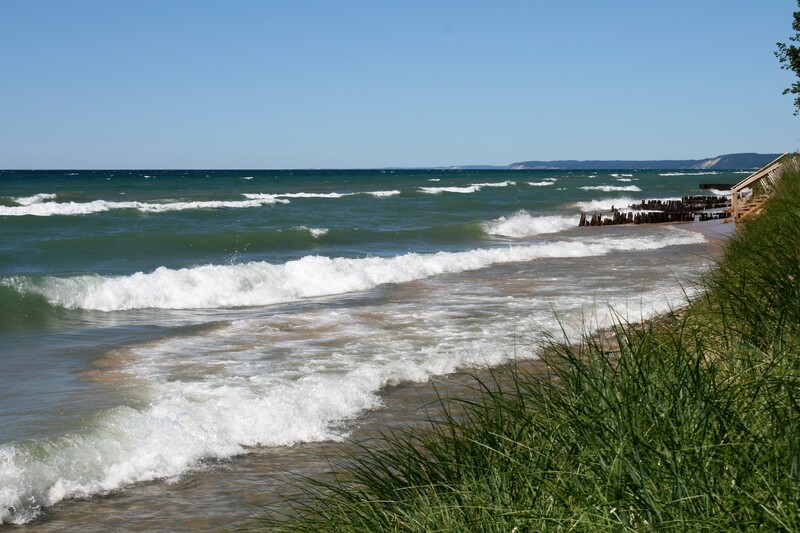 The harbours on Lake Michigan’s eastern shore are situated around inlets and rivers which feed the main lake. The State has a programme of harbour development and supports the local communities by providing facilities for boaters at the municipal marinas. At Frankfort, the marina was full but we were able to anchor in the channel and take the dinghy to go ashore for a meal and have a look round the busy town. 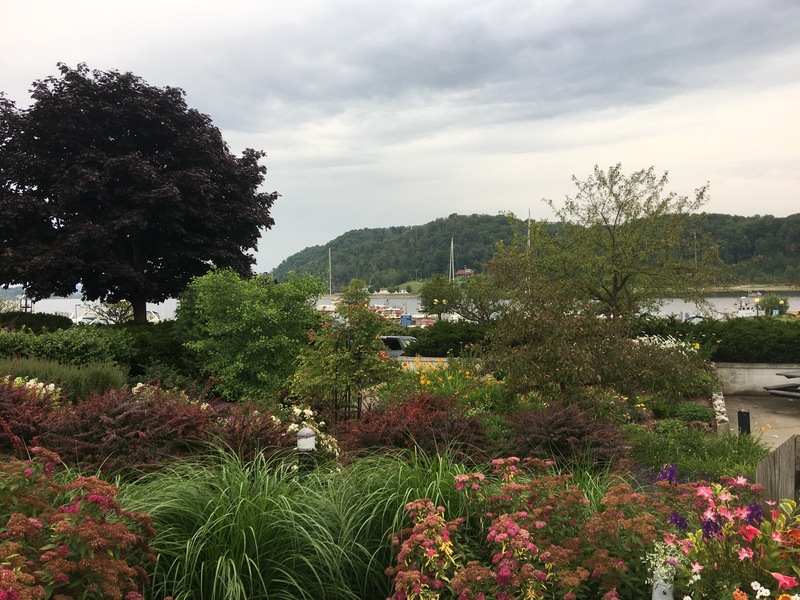 Like many places, the waterfront was attractive with a pretty garden area overlooking the channel. 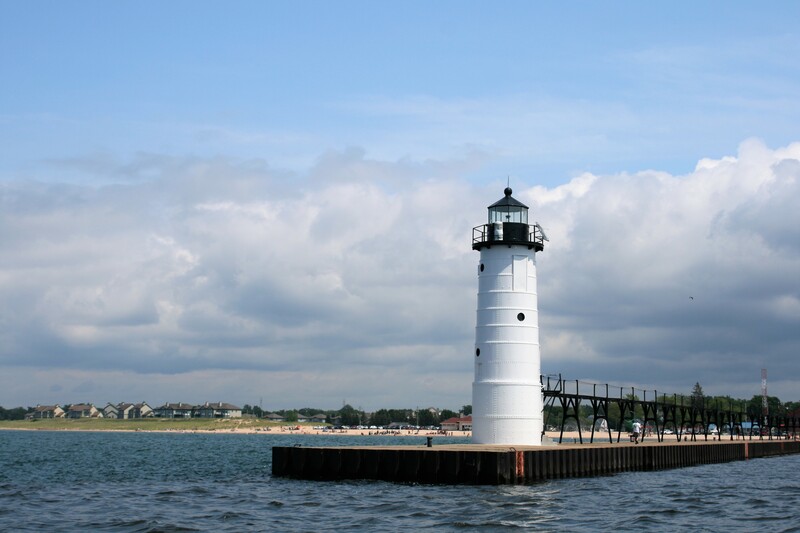 We left the next day for Manistee, where the lighthouse heralds the entrance to Big River and Manistee Lake beyond it. In Dozier’s Guide to the Waterways, it advises that ‘….if a crew change is necessary, airlines and buses serve Manistee.’ But Ian obviously felt I would do, for the time being. 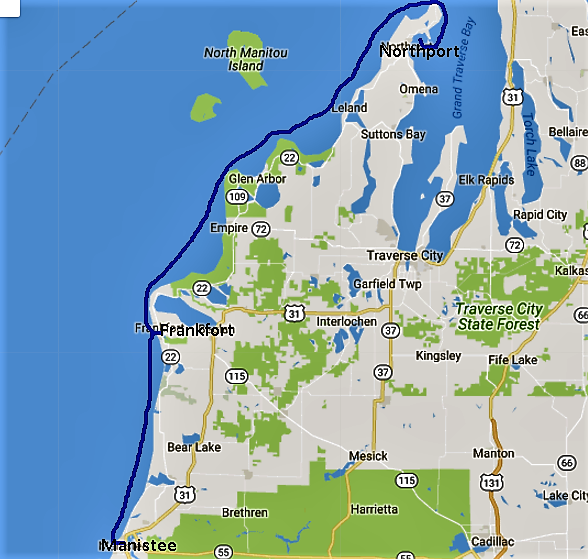 100 years ago, Manistee was an industrial centre with saltworks, an iron works and lumber factories, and large ships would come up Big River to transport goods. It had the largest number of millionaires per capita in the world. 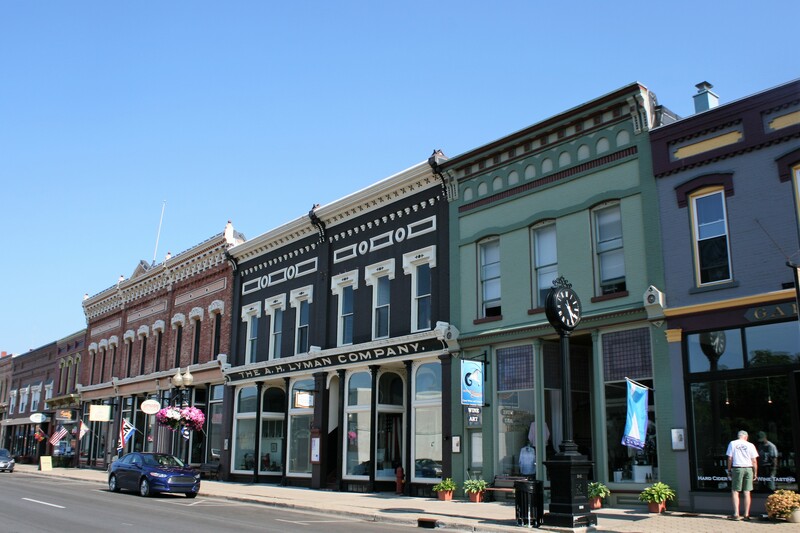 Some fine houses and other buildings are their legacy, and although the downtown has a number of boarded up premises, and Oleson’s the only decent supermarket has recently closed, the main street, overlooking the river, is attractive. 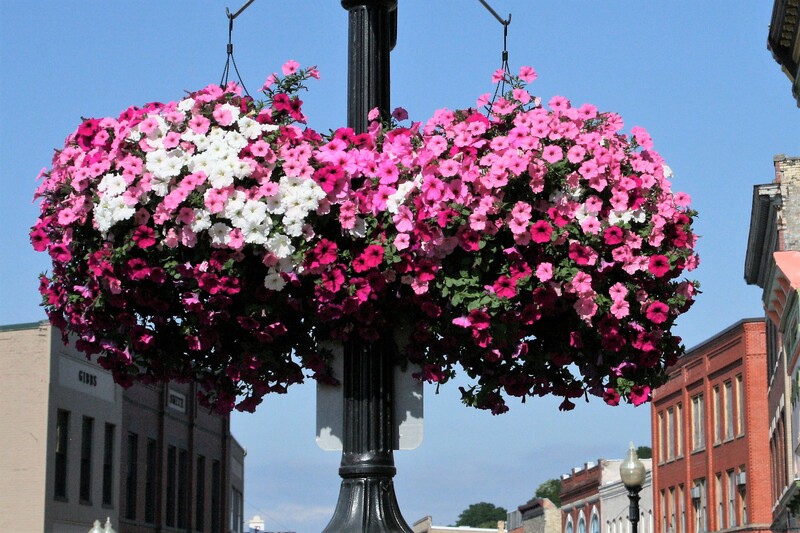 The old shop fronts have been retained and there are hanging baskets and small gardens everywhere. The south bank of the river, where the municipal marina is, has a boardwalk leading to the beach and that too is attractively landscaped. In the morning, I went in search of groceries. Family Dollar, on the opposite bank of the river, did have milk and orange juice but perhaps unsurprisingly, no fresh fruit, vegetables or meat. Miller’s produce store and another shop selling ‘organics real food’ were both closed at 9.45 on a Sunday morning. Feeling a little frustrated, I walked back along River Street, and a young woman said hello to me as she turned to open Glenwood Market, a shop which I had noticed the previous day, but which I had assumed sold only jams, cookies and other gift items. But it turned out they sold freshly made bread too, of various types. The one I chose was a potato/rosemary sourdough and after weeks of packaged supermarket bread, it was a luxury. And that was not all. They had fruit pies too. It took me a few minutes to decide that a large, 3-berry pie (cherry, raspberry and blueberry) would not take up too much space in our small refrigerator, that spending $13.50 on a pie was not wildly extravagant, and that we would manage to eat it all. We did, and it was worth every cent. We had hoped to leave later in the day and make some progress. We left the dock, cruised down the river past the lighthouse, and out into the lake. Two minutes later we turned back. The dockmaster said she wasn’t surprised we had returned. 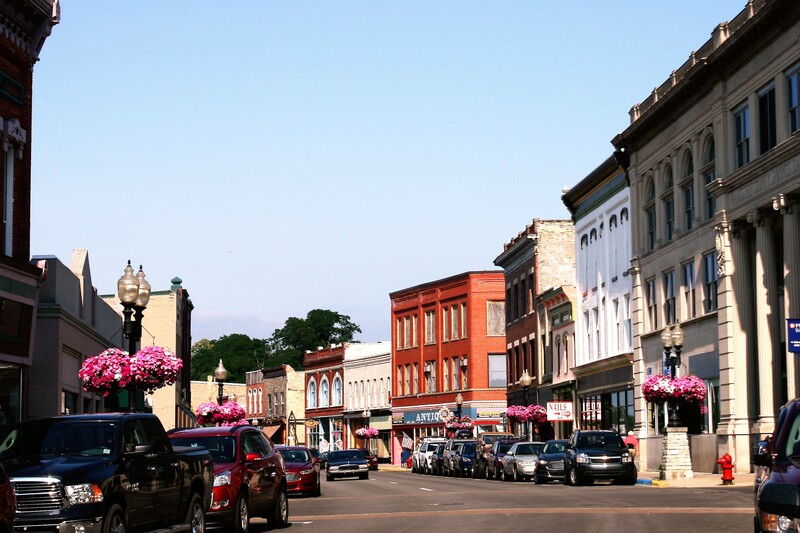 We went out and walked along River Street and consoled ourselves with some wine-tasting at Gardner’s, the outlet for the Douglas winery and invested in some very good Michigan Pinot Grigio. 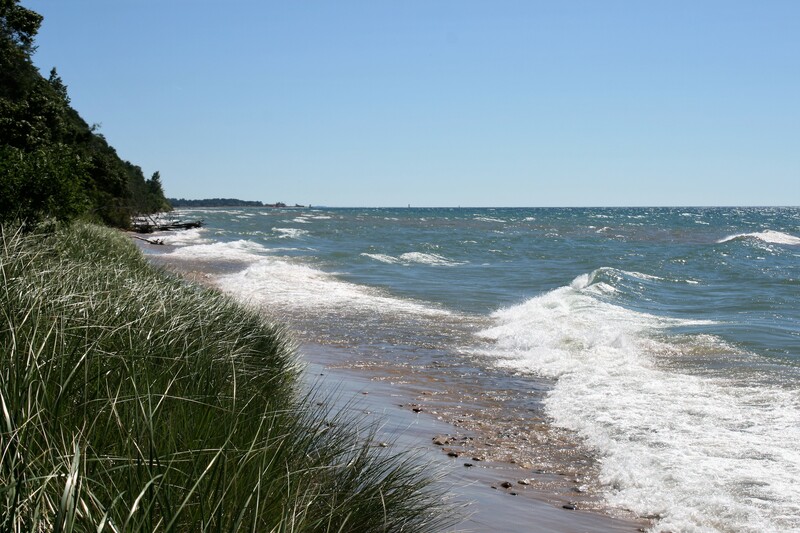 The strong winds continued so we had another day to explore Manistee. We went to the Manistee County Museum, and were given a conducted tour by Ray, who not only told us what everything was, but demonstrated how many of them actually worked. Most of the exhibits had been donated by local residents and gave a fascinating insight into the history of the area and how people lived. 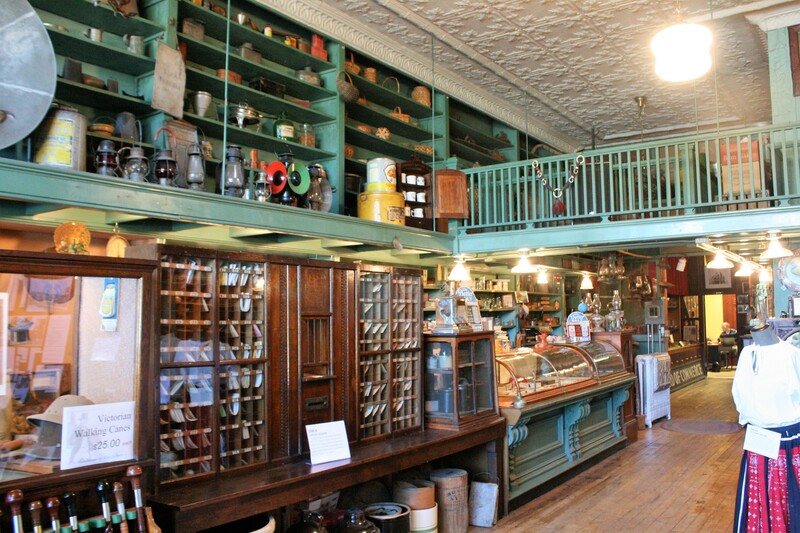 The building was originally Lyman’s Drugstore, and when the business closed in the 1950’s, the family donated the building and contents to the town. 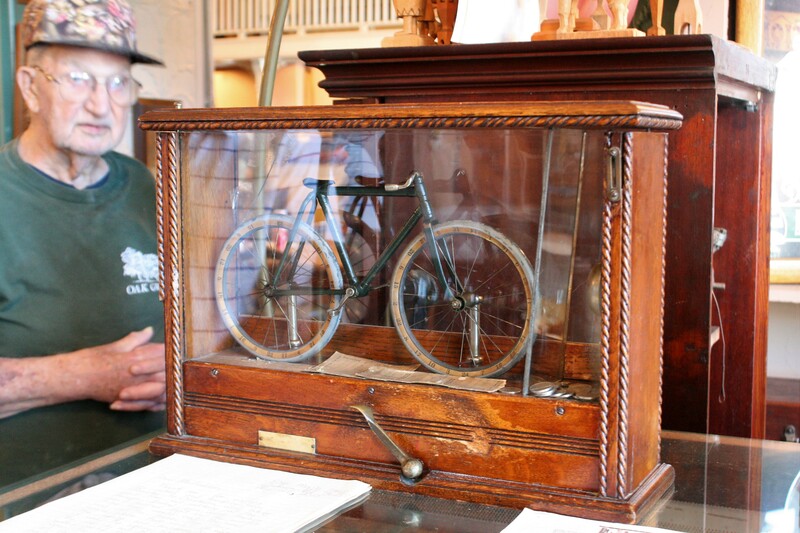 The bicycle originally dispensed cigars. Coins would be put in at the top, causing the wheels to turn round and a number would randomly come up. This would determine the number of cigars dispensed. Later, when it became an attraction for children, it was altered to dispense chocolates. 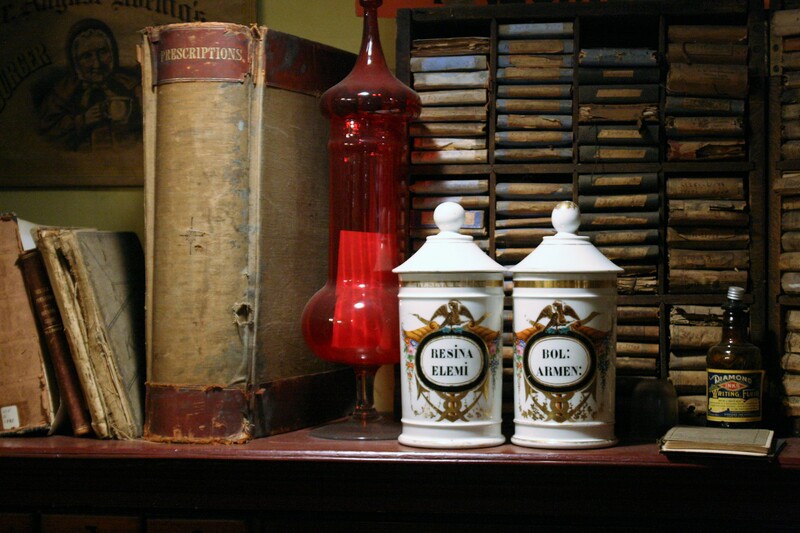 Upstairs, rooms were given over to displays of local businesses which had thrived in the past. 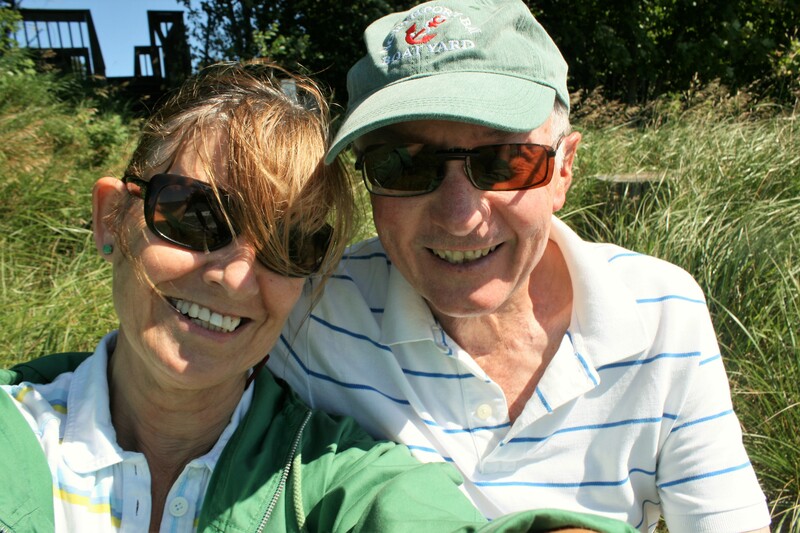 In the afternoon we cycled a few miles north to the Audubon bird sanctuary at Bluff Lake. 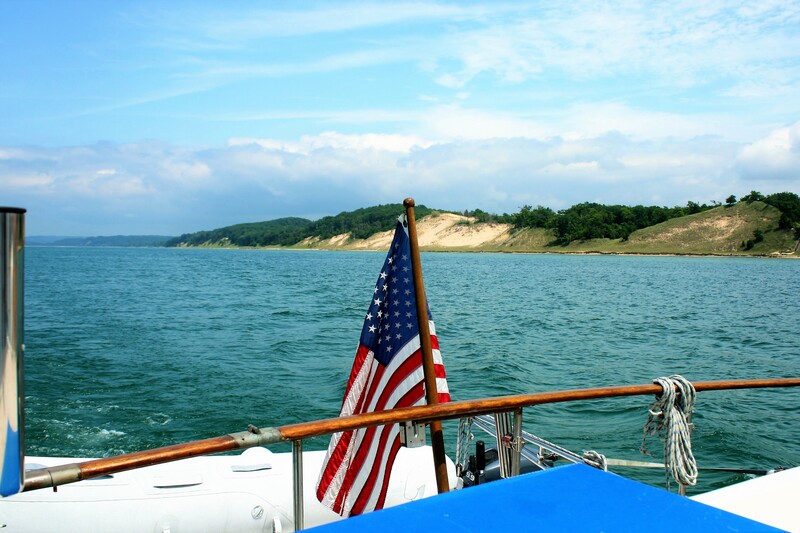 We didn’t see any birds, but the lake looked spectacular and the waves reminded us why we weren’t actually boating. It was our 47th wedding anniversary and in the evening we had good meal at the Bluefish Bar and Grille, overlooking Big River. What a fascinating account of this stretch. Envious of all except for the rough water. 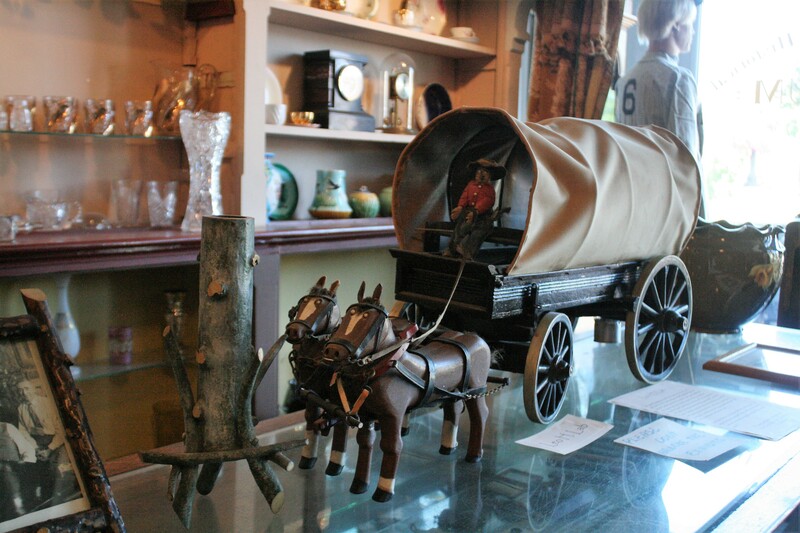 And what a poignant story of the displaced pioneers. 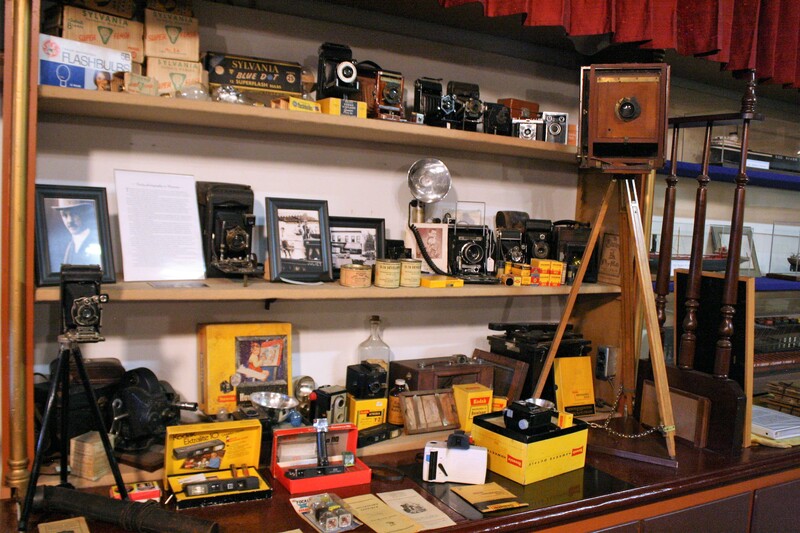 Loved the photos of the museum especially the chocolate dispensing bicycle. Well, I’m feeling sea sick & hungary for fruit pie & want a go on the chocolate machine. The rollercoaster ride will really make you feel this is an adventure with risks. 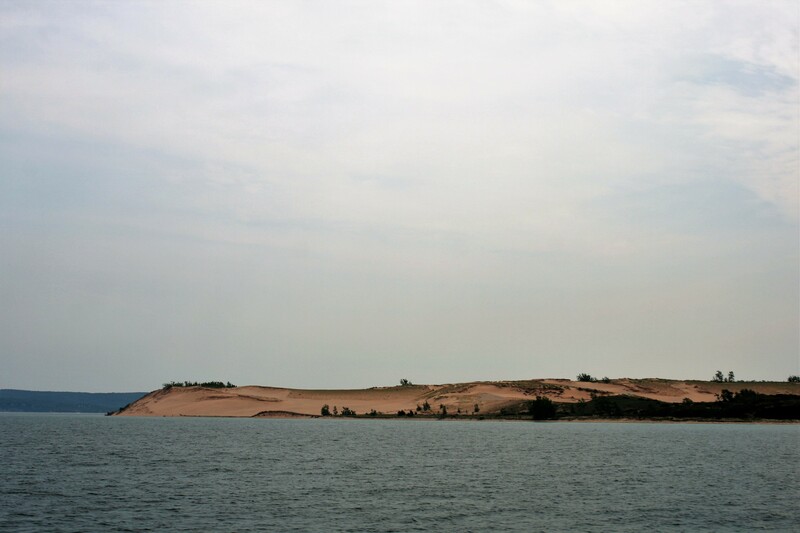 I was particularly interested in the sand dunes & N Manitou Island. What a tragedy for that community having survived so much. I hope you get on your way safely & pleased the Cap’n isn’t changing his crew after 47 yrs. congratulations on many fronts.